Jenny is a celebrated screen artist, she was awarded an honourable mention at the 2007 imagineNATIVE Film Festival, Toronto, Canada and in 2009, was nominated for a Deadly Award. In 2013 she was made an Associate Member Centre for Creative Arts at La Trobe University, and is set to graduate with a PhD through Batchelor Institute in the Northern Territory. Barbara McGrady is a Gamilaroi Murri yinah (woman) from the north west of NSW and Southern Queensland. A Sydney based photographer, Barbara's images tell the story of contemporary Aboriginal history through her unique sociological eye. Barbara describes herself as an observer and a protagonist - a 'documentarian' of historical events that are important to Aboriginal culture and people. Gertrude Davis is a photographer and media presenter. She is of Gugu-Yimithirr and Kuku Yalanji heritage, was born in Mossman and grew up on the Atherton Tableland in Far North Queensland.   She has studied photography and film making and also worked as a documentary photographer at many events around the country, and been published in the Koori Mail.   Gertrudes work is held in collections including the State Archives, and the North Queensland Land Council. r e a is a Gamilaraay/Wailwan artist, originally from Coonabarabran, a remote town in New South Wales, and has been based in Sydney for some time. r e a has a background in electronics in her mainstream employment and went on to study photography at the College of Fine Arts in Sydney and at post-graduate level including Digital Imaging and Design at New York University. Her qualifications include: BA, Fine Art, University of New South Wales, Sydney; MA (Visual Arts), Australian National University, Canberra; MSc, Digital Imaging and Design, (CADA), New York University, USA. Charmaine Joy Green was born at Eradu (between Geraldton and Mullewa) on Amangu country and is a member of the Wajarri and Badimaya cultural groups from the Yamaji Nation of Western Australia. Green is a visual artist, poet and writer who recently moved into installation work. She began writing poetry in Mullewa in the late 1970’s – writing under the name Charmaine Papertalk-Green. Charmaine was instrumental in the incubation of the nationally and internationally touring exhibition “Ilgarijiri – Things belonging to the Sky” arts and cultural project a Yamaji Art collaboration with the Curtin Institute of Radio Astronomy Curtin University, Square Kilometer Array (SKA) project Australian Government and City of Greater Geraldton. Vicki West is a Tasmanian Aboriginal installation artist who works with kelp, textiles, vines and seeds to create sculptural installations that speak of the impact of invasion, government policies, land rights and social justice issues. West is a descendant of the Trawlwoolway people of north-east Tasmania and her heritage inspires much of her artwork. She works with kelp, dodder vines and seeds that connects her to her ancestors, in particular the women and their kelp and weaving traditions. In 2008 West completed her Masters of Fine Arts at the University of Tasmania’s School of Visual and Performing Arts, Launceston. 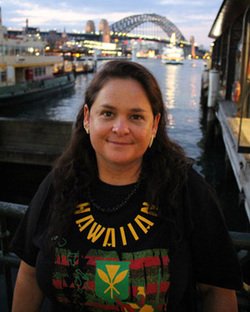 Sandy O’Sullivan is a Wiradjuri woman and a Senior Aboriginal Researcher at Batchelor Institute of Indigenous Tertiary Education. Sandy has a PhD in Art and Performance, and writes and makes across the museums, art and education fields. She has been an artist for over 25 years and has exhibited in Australia and internationally. Her current international research study, funded by the Australian Research Council, focuses on representation and engagement of First Peoples in major museum spaces. Sandy is committed to supporting positive outcomes for First Peoples in the context of museums and other Keeping Places. Colleen Raven is an Arabunna woman with a passion in capturing aboriginal people in all areas of life. Starting her career in 2011 she quickly developed her skills and community involvement and has had her images in all forms of media, the latest images being sent to CNN fashion in America. Colleen mainly focuses on portrait photography and fashion with a lot of her aboriginal models finding work in the industry due to her works. She is also quickly developing her skills in photo manipulation. She currently lives and works in Adelaide, South Australia. Sharon Karami is a photographer based in Cairns, hailing from the Aboriginal community of Cherbourg in South East Queensland. Recently she began exploring the different styles of working the camera and joined up with other locals who share similar interests, being behind the camera, and have introduced her to an array of special effects to get the best out of her subjects and camera. Sharon is currently studying for a Bachelor of Arts at Deakin University. Michelle Blakeney is a Yaegl woman from the Far North Coast of New South Wales. She has been a photographer for several years, and her continuing passion and ambition is to document her own people's unique culture and history through photography. Hundreds of photographs stored in crates at her mother's house record over 16 years of familial events and gatherings. While for many families this is not out of the ordinary, for Aboriginal families, many of whom are only now recovering members from forced separations, photography provides a link from the past to the present that is immediate and powerful. It is this healing power of photography that fuels her love of the medium. Currently a resident of Sydney, Michelle branched out from her photographic practice to encompass screen-based practice. Jo-Anne Driessens was born in 1970 Brisbane-Australia and was adopted by a white Australian family at two weeks old, during the late 1980’s her interest in Photography began to take shape and she entered the world of documenting community which eventually led to her meeting her blood family through the camera lens. !With an extensive body of work from every day life of community events and places including a four year Photographic Cadetship with the State Library of Queensland, the importance of documenting and archiving is not taken for granted. Nickeema Williams is a young Cairns-based multidisciplinary visual artist, photographer and designer. She uses whatever materials she can get her hands on, whether its ink, acrylics, watercolour, graphite or a video camera and she has started to develop her own style and themes. Her works tends to influenced by connections both spiritually and emotionally. Nickeema is also a member of a new Artist run initiative in Cairns called TBA which was formed with some of her fellow TAFE graduates. Gertrude Ygosse is a photographer and media presenter. She is of Gugu-Yimithirrand Kuku Yalanji heritage, was born in Mossman and grew up on the AthertonTableland. She has studied photography and film making and also worked as a documentary photographer at many events around the country, and been published in the Koori Mail. Gertrudes work is held in collections including the State Library, State Archives, the North Queensland Land Council and Cape York Land Council. Paul Bong (Bindur-Bullin) was named after a young warrior and grew up in Gordonvale before moving with his parents to Brisbane in 1978. 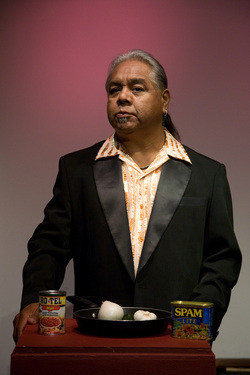 Bong returned to Cairns in 1984 and completed the Associate Diploma of Visual Arts at the Tropical North Queensland Institute of TAFE. He was commissioned to produce works for Brisbane’s International airport in 1995 in which he painted shields carved by his uncle Stewart Bong, out of native fig. His designs included incorporated representations of spiders, axes and a traditional Yidinji icon of a scorpion sting. Arone Meeks produces paintings, sculpture and prints that express a passion for country, spirituality, sexuality and politics. His path is one that redefines his connections through art mediums. The spiritual is actualised through art and his response is one of ‘working it through’ an intuitive process. Arone is able to express a unique spiritual response to country that has a harmony in connecting disparate worlds. Arone was born in Laura and lives in Cairns. He has had both a traditional and formal education, having been taught by his grandfather and other relatives before going to study at the City Art Institute in Sydney. hands. Zane has works in the collections of the National Gallery of Australia, The NGV, and other state and corporate collections. Elverina Johnson is a Kunganji Woman of Yarrabah, and her parents are from the Murgha and Fourmile families. A writer, artist, curator, researcher, and community leader, Elverina also volunteers as a Liaison Officer for the Dirringhi Aboriginal Corporation, which she co-founded, and specialises in developing arts and education activities within schools. She has made a commitment to showing leadership within Indigenous communities to inspire and motivate young people through music, art and drama and to embrace education and life affirming opportunities. Elverina organises the annual Black Women Strong Conferences in her home community. Luke Briscoe is a Kuku Yalanji Filmmaker and Musician. Luke has over 18 years experience within the music, arts and media industries acquiring extensive experience in film, from pre-production to production, such as writing, producing, directing, lighting, sound, editing, and cinematography. In 2010 Mr Briscoe wrote and directed a short film titled “Jhindu” with-in the mossman and cairns communities. Jhindu screened on NITV is listed in the Screen Australia’s Black List book and is currently working on another film. Hailing from honourable ancestors of the Birri-Gubba, Munanjali, Germanic and Gaelic peoples, Samuel Wagan Watson grew up in a family of accomplished authors, political players, entrepreneurs, academics, artists and raconteurs. He was born ‘illegally’ in Brisbane in 1972, and survived his teenage years on the Sunshine Coast. Collected works of Samuel’s poetry have achieved prodigious accolades and are translated into 7 languages, various musical compositions, the subject of film and television productions and public/visual art projects. Samuel has been commissioned to write for a number of government and corporate entities, ranging from Brisbane City Council to the Japanese Aeronautical Exploration Agency. He is currently a freelance writer working on selected commissions and is finishing two books due for release later in 2014.